Deep convection has exploded with the disturbance that we have been watching for the past few days. 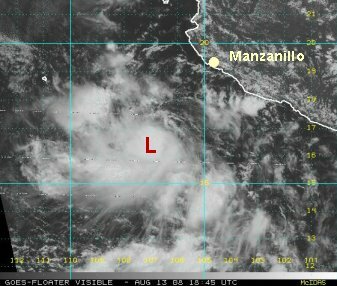 It is centered near 16.3 N 105.8 W or about 210 miles south-southwest of Manzanillo. 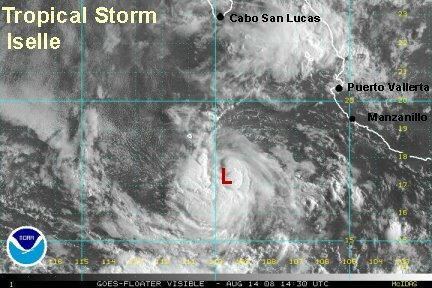 It is moving west-northwest and should pass well south of Cabo. Increasing swell will be the main, if not the only threat to Mexico. NHC has it as 35 mph, but it probably is tropical storm Iselle at 40 or 45 mph by our estimate. It looks like NHC will upgrade the tropical depression to agree with our earlier assesment of the tropical depression. We came across a tropical storm designation on a website connected to NHC. So it looks like officially at 5 pm they will upgrade to Iselle also. The latest satellite imagery actually doesn't look as impressive as earlier, but the circulation is ample with the convection to say that the system is about 40 mph sustained. At 4 pm edt the center of circulation was near 16.5 N / 106.7 W or about 225 miles southwest of Manzanillo, MX. Movement is west away from Mexico. Swell appears to be the only effect on Mexico. NHC officially did name Iselle at 5 pm edt (2 pm pdt). 40 mph. 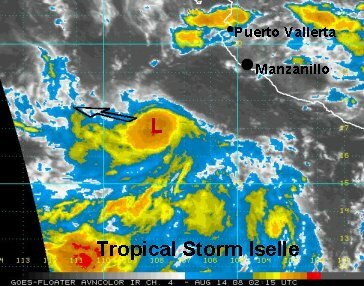 Tropical storm Iselle is centered near 16.7 N / 108.0 W or about 275 miles southwest of Manzanillo. 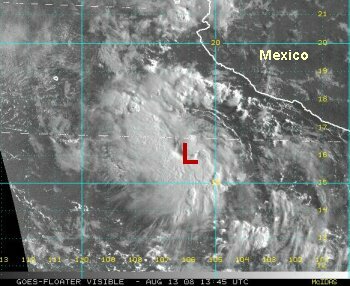 The low is under the deepest convection as it moves west-northwest away from Mexico at around 12 mph. A few models turn the storm northward toward Cabo. Most take is well south of Cabo. Right now we think it should stay south, but will watch for any deviant treands. Tropical storm Iselle is centered near 17.8 N / 109.4 W or about 355 miles south of Cabo. The only notice of Iselle to Mexico will be an increase in swell. It is slowly moving northwest at around 8 mph. 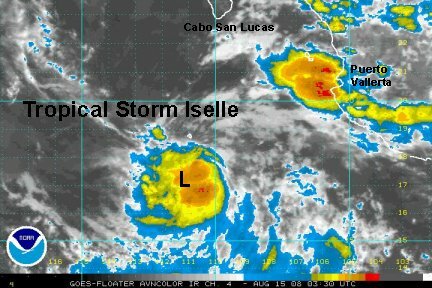 Tropical storm Iselle is centered about 370 miles south-southwest of Cabo. It is slowly moving west at around 9 mph. Higher than normal swell may be experienced near Cabo. Since Iselle is no threat to Mexico and moving farther away, this will be the last update.